There are times you need to freeze a particular frame from a read sequence for use in camera projection or cleanup. 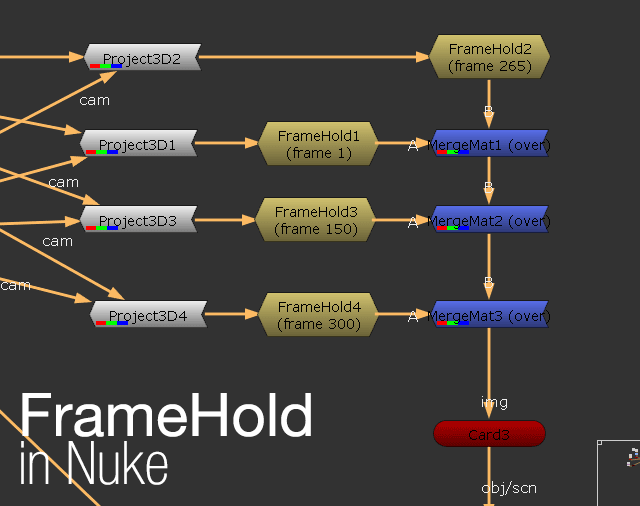 Nuke have a handy way to quickly freeze to your chosen frame number using the FrameHold node. It is similar to After Effects Freeze Frame function which you can see more at PremiumBeat. Turn out Nuke FrameHold got another extra feature that AE lacking for now (well it can be done but requires some scripting). A quick look at the properties shows only two functions in FrameHold. Obviously you want to type in the frame number that you want to freeze into the first frame input. Now for increment, it is a unique way to create a sort of stop motion feel. For example, if you use a value of 5 for increment then Nuke will show the next frame at the increment of 5. If you understand basic Python, you can write an expression to create a random increment which should be interesting for any motion graphic work (or creating a distorted video streaming effect as commonly seen with Malaysia internet service). So remember to not read in a single frame file as a workaround! I know some folks might do it if they are really new to Nuke. As a newbie it’s great to use posts like these to reiterate the basics.